Updated as of 2:05 pm, April 17th, 2019. Lightly edited for grammar, syntax and a redundancy. The faculty-led committee will cut 84 degree programs as part of an effort to prepare TU for changes in the academic landscape. Recent, drastic changes announced at the University of Tulsa have a significant portion of TU studentry and faculty challenging decisions made by the administration. Specifically, TU will be losing 40 percent of its degree programs, going from 196 programs across five colleges to 112. This restructuring also includes a reorganization of the various colleges on campus into three distinct categories: Henry Kendall College, which will retain the Arts and Sciences curriculum with a new emphasis on interdisciplinary studies; Engineering and Natural Sciences, which will retain curriculum from those two fields of studies; and a “Professional Super College,” which will combine the business, law and health colleges. Regarding these large changes, President Clancy said, “I actually call it the third transformation of TU.” This is the largest and most significant change seen by the university in over three decades. The following information is paraphrased from a more in-depth timeline at utulsa.edu/truecommitment. June 2018: The Provost’s Program Review Committee (PPRC) is formed. Nominees are chosen by the Faculty Senate and interviewed by the president, provost and Faculty Senate. Tracy Manly, an accounting professor, is named chair of the committee. July – Sept. 2018: Program data collection methods are devised and put into action. Data will be used to determine which programs will be cut. Sept. – Dec. 2018: Data from every program on campus is reviewed. Data sheets are released and available for review in the provost’s office. Jan. 2019: PPRC finalizes suggestions with deans. Feb. – March 2019: Suggestions are shared with other administration staff, as well as the board of trustees. Plans for implementation come into focus. Apr. 2019: Board of trustees approves the PPRC’s suggestions, which are subsequently shared with all teaching faculty in a meeting between 10:00 a.m. and around 11:20 a.m. on Thursday, April 11, 2019. To that end, the PPRC’s responsibilities have primarily revolved around the decisions of which programs to cut. What Clancy sees as a need for the university to adapt to a changing landscape for higher education influences the decision to cut programs. “This is for the long-term benefit of the students, and for the long-term benefit of the institution,” said Clancy. He referred to a line chart that showed the number of college-attending students dropping rapidly and suddenly by 2030. The PPRC’s suggestions were reportedly made regarding participation rates and other aspects of program viability. “We didn’t want the decisions to be financially driven; we wanted it to be [about] quality of education. … We didn’t want that hanging over their head over and over again, that we’ll do this for cost-cutting measures; that we’ll do this for financial reasons,” Clancy explained. Nominees to the PPRC, according to Tracy Manly, were asked if they were willing to make cuts to their own programs, and they were denied a seat on the committee if they refused. “[We wanted to know, w]ere they willing to work for the university, rather than just their departments?” Clancy explained. “Decision-making has not been strategically driven. For example, academic programs are eliminated through attrition and scarce resources. “Some 20 programs have had six or fewer graduates per year over three recent years[.] The only mechanism shared for the elimination of programs is the attrition of program faculty. “The current process of program review also does not include a mechanism to evaluate program alignment with mission or strategic plan to allow for mission-driven allocation of resources. Program elimination appears to be primarily driven by faculty attrition rather than institutional mission and enrollment. The other two major shifts mentioned in the “Academic Strategy” document involve the shift from departments to “interdisciplinary division[s],” as well as the creation of the new Professional Super College. Perhaps the changes most noticed by students, however, are the program cuts and changes. A great portion of the program changes affect graduate programs, and as the True Commitment webpage states, “[T]he program prioritization decisions admittedly impact graduate programs more than undergraduate programs.” Clancy reaffirmed this in the Student Forum held on Friday, April 12. Many undergraduate programs are affected as well, however, including the philosophy and religion majors, which have now been consolidated to a single minor, many of the foreign language minors, most of the music majors and every theater major. Administration has repeatedly stated that these changes won’t affect current, enrolled students at the University of Tulsa, and that each student will have the full support of the university in attaining their degree. These changes are slated to begin after December 2020, after which incoming freshmen will not be able to enroll in these programs. Administration is also vocal in affirming that the affected programs only account for six percent of the studentry at TU, both for primary and double majors. The Collegian was unable to confirm if this statistic also included program minors. Following the April 11 announcement of the university’s upcoming changes, community backlash was swift. Students and faculty immediately began planning protest events. That Thursday, flyers appeared around campus, announcing “This is NOT who we are,” with a call to wear black during the week of April 15 – 21 to mourn the lost programs, as well as the announcement of a funeral walk on April 19. A protest meeting was hosted by students and faculty in Kendall Hall at noon on Friday, April 12, at which students and faculty gave testimonies in the interest of retaining the liberal arts programs planned to be cut at TU. Following this, on the morning of Friday, April 12, a day after the PPRC’s suggestions were announced, a document penned by philosophy professor Jacob Howland began circulating between student emails. The manifesto, which numbers almost 5,000 words, decries what Howland sees as the corporatization of the University of Tulsa. The document claims, “Absent a board willing and able to defend our integrity as an academic institution, we have experienced a hostile takeover that has effectively made TU a subsidiary of Tulsa’s biggest charitable foundation and an agent of the city’s corporate interests.” It also criticizes the university’s lack of faculty raises since 2015 and its attachment to the athletics department, which did not undergo any cuts or changes from the PPRC. The PPRC was primarily concerned with academics. Romanello also provided a statement, criticizing the transparency of the PPRC’s process and what she interpreted as poor communication with faculty. Various anonymous faculty sources reached out to The Collegian expressing concern and outrage over the cutting of liberal arts, the efficacy and utility for the university in cutting those programs and the transparency of the PPRC’s data-gathering methods. Other anonymous faculty, however, leaned optimistic toward the new changes, claiming that the PPRC’s methods were more transparent than anything in that vein that the administration has done in the past 30 years and that the changes could lead to more good than bad. Clancy also asserted that the changes coming to campus have come about as a result of the HLC’s accreditation standards, and that rather than corporatization, the changes more accurately reflect organization. 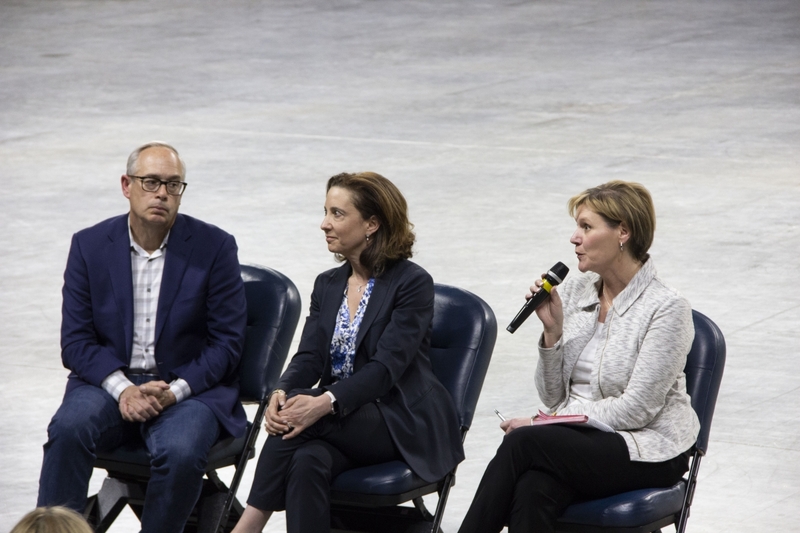 As of yet, the administration has not levied a specific response to Howland’s manifesto, but Clancy did call for a student open forum at the Reynolds Center on the evening of Friday, April 12. Present at the forum were President Clancy, Provost Janet Levit and Dr. Tracy Manly, an accounting professor who served as chair of the PPRC. She also mentioned later on that the PPRC’s data sheets are all available for review in the provost’s office and that very few students have come to look them over. The three on the panel also denied a request to upload the document to the internet, reiterating that the information is available in the provost’s office. A complete video of the student forum is available on The Collegian’s Facebook page. Following the open forum, Clancy remained on the stadium floor and spoke to students individually for some time. He was adamant that students and faculty familiarize themselves with the “Academic Strategy” document, which is hyperlinked at utulsa.edu/truecommitment. The protests on campus will seemingly go on, and some students are attempting to get the hashtags “#TUReorganization” and “#WeAreTheSixPercent” trending. Online chatter is high and, for the most part, angry. Clancy mentioned at the end of the student forum that there would be more events like it, and that communication between the administration and the studentry would continue. Administration has shown no sign of retracting any of the changes thus far. These changes, part of TU’s five-year academic plan, will only begin after 2020, and the entire transition will take four to five years. It remains to be seen how permanent the changes will be. Clancy, and the administration at large, see the changing landscape for higher education and have acknowledged doomsday predictions from respected economists like Harvard’s Clayton Christensen, who posits that half of the higher-learning facilities in the United States will close in the next decade. The coming changes will be made in the interest of braving this theoretical storm. As Clancy said, “Part of what we’re doing right now is getting ready for this.” It remains to be seen if the changes will ultimately be implemented or if the protests will bear a settlement with the administration.